Since Arnold Schwarzenegger ended his tenure as the governor of California, he has returned to the spotlight as a movie star. Appearing in The Last Stand earlier this year, Schwarzenegger has talked previously about returning to his iconic roles in a new Terminator and Conan film. The last we heard about Terminator 5, Patrick Lussier and Laeta Kalogridis had been brought on to script the film for Skydance Productions and Annapurna Pictures. 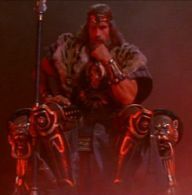 As for The Legend of Conan, it is said to be a direct sequel to 1984’s Conan the Barbarian and will ignore the events of both Conan the Destroyer and of the most recent reboot, 2011’s Conan the Barbarian. Would you be interested in seeing Schwarzenegger take on these roles again? Sound off below!